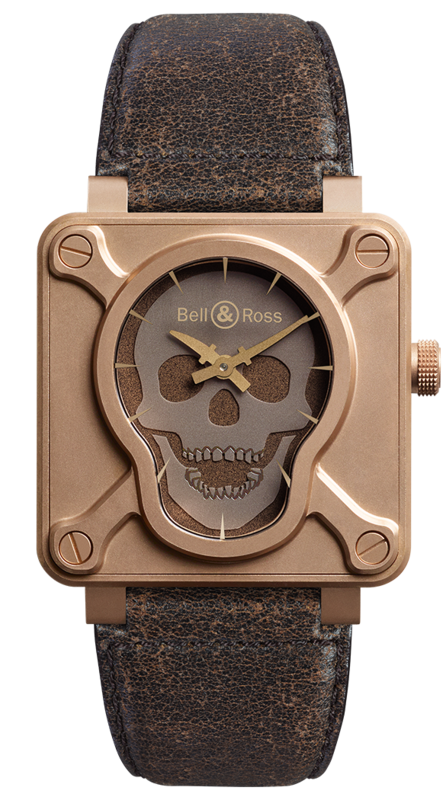 In 2009, Bell & Ross made a lasting impression by breaking with traditional watchmaking codes with its first Skull BR 01. This new version, with its distinctive character, pays tribute to the epic of the parachutists of the Second World War. Sporting the colour black, which symbolises death, the phantom monochrome dial features other traditional military codes as its hour and minute hands: the dagger and the sabre. The bronze colour of the case and the aged look of the leather strap reinforce the vintage and warrior aspects of the watch, which is certain to win over collectors and watchlovers of character. In perfect compliance with watchmaking quality standards, this alloy of copper (92%) and tin (8%) offers excellent resistance to wear while sporting a very distinctive colour. Initially presenting a shade suggesting tones of pink or red gold, bronze acquires a patina over time, which gives it an incomparable ancient look. the solidity and longevity of the material, this patina, which varies depending on the climate and the season, gives the BR 01 SKULL BRONZE a particular colouring that makes every watch an abso- lutely unique piece. Case: 46 mm in diameter. Bronze CuSn8. Screw-down crown. Dial: black. Photoluminescent skull. Gilt hands. Gilt metal index underneath the crystal. Buckle: pin. Grey PVD* coated steel.